Seized Drug Assets Pad Police Budgets Justice Department data show that the amount of drug-related assets confiscated since 2004 has tripled, from $567 million to $1.6 billion. Critics claim some law enforcement agencies have become "addicted to drug money" in their quest to fill their own coffers. For an explanation of how drug asset seizures work, read our FAQ. Cpl. 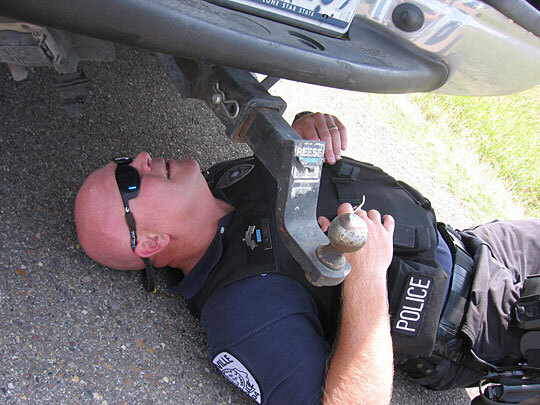 Mark Frost of the Kingsville Police Department in Texas inspects the rear deck of a pickup for smuggled currency. Richard Weber, the Justice Department’s chief of Asset Forfeiture & Money Laundering, discusses drug forfeiture laws. 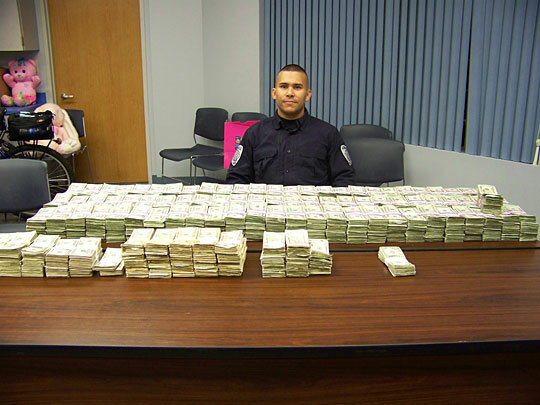 Investigator Mike Tamez of the Kingsville Police Department shows off the $1 million he discovered in a hidden compartment of a Land Rover in January 2008. 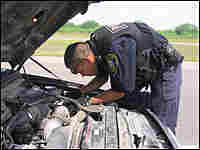 Tamez searches an engine compartment for hidden drug money. Every year, about $12 billion in drug profits returns to Mexico from the world's largest narcotics market — the United States. As a tactic in the war on drugs, law enforcement pursues that drug money and is then allowed to keep a portion as an incentive to fight crime. As a result, the amount of drug dollars flowing into local police budgets is staggering. Justice Department figures show that in the past four years alone, the amount of assets seized by local law enforcement agencies across the nation enrolled in the federal program—the vast majority of it cash—has tripled, from $567 million to $1.6 billion. And that doesn't include tens of millions more the agencies got from state asset forfeiture programs. In Texas, with its smuggling corridors to Mexico, public safety agencies seized more than $125 million last year. While drug-related asset forfeitures have expanded police budgets, critics say the flow of money distorts law enforcement — that some cops have become more interested in seizing money than drugs, more interested in working southbound than northbound lanes. "If a cop stops a car going north with a trunk full of cocaine, that makes great press coverage, makes a great photo. Then they destroy the cocaine," says Jack Fishman, an IRS special agent for 25 years who is now a criminal defense attorney in Atlanta. "If they catch 'em going south with a suitcase full of cash, the police department just paid for its budget for the year." U.S. Highway 77 follows the coastal bend of South Texas past mesquite thickets, grapefruit stands and vast historic ranches on its way to the Mexican border. Drug agents say Highway 77 is one of the busiest smuggling corridors in the world. Think of it as a great two-way river — drugs flow north, drug money flows south. For the impoverished cities and counties situated along 77, it is like a river of gold. On one 15-mile section that runs through Texas' Kleberg County, the southbound lanes have become a "piggy bank," according to the local sheriff. In the past four years, combined seizures have surpassed $7 million. It starts with a traffic stop. "Look at this hose. Look on this side. So that tells me somebody has messed with it. 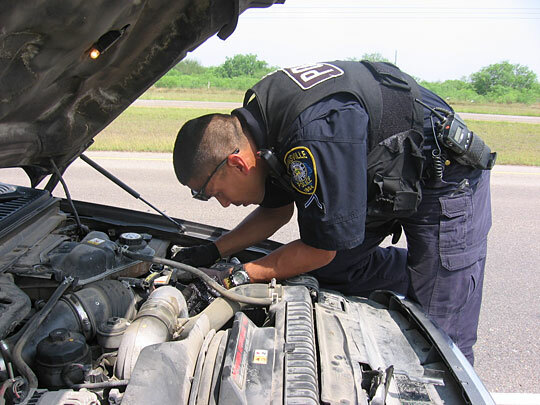 I have fingerprints right here," says officer Mike Tamez of the Kingsville Police Department, as he inspects the engine of a gray Ford pickup truck that was headed south. He's looking for clues to where the driver might have hidden drug money. "Come over and look at [the] air filter housing? Look how clean these are compared to the other parts of the vehicle," he says. After searching for 20 minutes, Tamez and the other officers crawling over the truck don't find anything, and they send the motorists on their way. In January, Tamez — a gung-ho former Marine with a buzz cut — stopped a white Land Rover for changing lanes without using a blinker. The driver's story was inconsistent. Then Tamez noticed fresh silicone under the rear deck. A density meter showed something bulky inside. He brought it into the shop to investigate. "When I pulled the drill bit out there was pieces of money on it, currency. Inside the compartments we discovered 80 bundles of U.S. currency. He disavowed knowledge of everything," Tamez says. The bundles contained $1 million. According to the law, 80 percent of that will go to the Kingsville Police Department. So that one afternoon's work will boost the department's budget by 25 percent. "Law enforcement has become a business, and where best to hit these narcotics organizations other than in the pocketbook? That's where it's going to hurt the most. And then to be able to turn around and use those same assets to benefit our department, that's a win-win situation as far as we're concerned," says Kingsville Police Chief Ricardo Torres. In this sleepy city of 25,000 people, with its enviable low crime rate, police officers drive high-performance Dodge Chargers and use $40,000 digital ticket writers. They'll soon carry military-style assault rifles, and the SWAT team recently acquired sniper rifles. When asked why the Kingsville Police Department needs sniper rifles, Torres says, "With homeland security, we all hear about where best to hit than ... Middle America. This can be considered that sort of area. We have to be prepared." Federal and state rules governing asset forfeiture explicitly discourage law enforcement agencies from becoming dependent on seized drug money or allowing the prospect of those funds to influence law enforcement decisions. There is a law enforcement culture — particularly in the South — in which police agencies have grown, in the words of one state senator from South Texas, "addicted to drug money." Part of the problem lies with governing bodies that count on the dirty money and, in essence, force public safety departments to freelance their own funding. In Kleberg County, where Kingsville is the county seat, Sheriff Ed Mata drives a gleaming new police-package Ford Expedition bought with drug funds. This year, he went to his commissioners to ask for more new vehicles. "They said, 'Well, there ain't no money, use your assets,' " he says. He says his office needs the money "to continue to operate on the magnitude we need." Another county agency, the Kingsville Specialized Crimes and Narcotics Task Force, survives solely on seized cash. Said one neighboring lawman, "They eat what they kill." A review by NPR shows at least three other Texas task forces that also are funded exclusively by confiscated drug assets. The concern here is that allowing sworn peace officers — who are entrusted with enormous powers — to make money off police work distorts criminal justice. "We're not going to sidestep the law and seize people's money just for the financial gains of the department," Tamez says. "It's not going to happen." This series was produced for broadcast by Marisa Penaloza. Why is there so much drug money moving on U.S. highways, and what happened to money-laundering through banks? First, Mexican traffickers who've taken over distribution networks in the United States prefer to smuggle profits back in bulk cash. Second, it's gotten harder to move dirty money through the financial system since a government crackdown after the terrorist attacks of Sept. 11. According to veteran DEA agent Jack Riley: "The idea of money-laundering where a bunch of people in fancy suits are sitting around a table talking about moving their drug cash to a bank in the Bahamas and then over to Switzerland — we're not seeing that happen. What we're seeing is, the money's going back to Mexico the same way the drugs are — in the back of a car or in a concealed trap or in an 18-wheeler." How much drug money is out there, and how much of it is law enforcement confiscating? The Drug Enforcement Administration estimates $12 billion in drug profits is repatriated from the United States — the world's largest narcotics market — back to Latin America each year. Records with the Justice Department show that state law enforcement agencies seized $1.58 billion in 2007 alone, but that doesn't include the tens of millions of dollars that go through the state asset forfeiture programs — which are not tabulated in any central repository. Asset forfeiture is the confiscation of assets associated with the commission of a crime. It can be real estate, vehicles or currency. The federal law, passed in 1986, encourages police agencies to seize drug assets as a way to deny the narcotics cartels their profits and boost the crime-fighting budgets of the agencies. The states all passed their own asset forfeiture laws, which in many ways mimic the federal statute. What's the difference between criminal and civil forfeiture? In criminal forfeiture, the taking of property is usually carried out after the owner is convicted of a crime. In civil forfeiture, the government seizes the property — in this case, the currency — without ever charging the person with a crime. The government must show by a preponderance of the evidence that the money is dirty; then it's up to the owner to prove that his cash is clean. To defend the money requires hiring a lawyer, who often charges more than the amount of the seized cash. What are some of the rules of asset forfeiture? Federal and state laws, in general, say that a law enforcement agency that seizes assets may not "supplant" its own budget with confiscated funds, nor should "the prospect of receiving forfeited funds ... influence relative priorities of law enforcement agencies." NPR has found examples, mainly in the South, in which both of these things have happened. What can law enforcement agencies use seized assets for? In general, they're supposed to be used for law enforcement purposes, such as equipment, training or first-year salaries. They are supposed to be a supplement to a police budget. Prosecutors can also use seized drug assets for the official purposes of their offices.